Bettina Daniels looked around the pink marble bathroom with a sigh and a smile. She had exactly half an hour. She was making remarkable time. Usually she had much less Time in which to make the transition from girl, student, and ordinary mortal to bird of paradise and hostess extraordinaire. But it was a metamorphosis she was thoroughly used to making. For fifteen years she had been her father’s aide-de-camp, going everywhere with him, fielding off reporters, taking telephone messages from his girlfriends, even sitting backstage to lend him support as he did late-night talk shows to promote his latest book. He scarcely needed to make the effort to do the promotions. His last seven books had automatically spiraled up The New York Times Bestseller List, but still, promotion was something one did. Besides which, he loved it. He loved the preening and parading, the food for his ego, and the women who found him irresistible, confusing him with the heroes in his books. It was easy to confuse Justin Daniels with the hero in a novel. In some ways Bettina herself had done it for years. He was so blatantly beautiful, so unfailingly charming, so witty, so funny, so delightful to be with. Sometimes it was difficult to remember how selfish, how egotistical, how ruthless he could also be. But Bettina knew both sides of the man, and she loved him anyway. He had been her hero, her companion, and her best friend for years. And she knew him well. She knew all the flaws and the foibles, all the sins and fears, but she knew too the beauty of the man, the brilliance, the gentleness of his soul, and she loved him with every ounce of her being, and knew that she always would. He had failed her and hurt her, he had forgotten to be at school for almost every important moment, had never shown up for a race or a play. He had assured her that young people were boring, and dragged her over the years, mainly in the pursuit of his own shimmering dreams. It never occurred to him that she had a right to a childhood, and picnics and beaches, birthday parties, and afternoons in the park. Her picnics were at the Ritz or the Plaza-AthÈnÈ in Paris, her beaches were Southampton and Deauville, her birthday parties were with his friends at 21 in New York or the Bistro in Beverly Hills; and rather than afternoons in the park he would insist she accompany him on the yacht cruses he was constantly being invited to share. Hers was hardly a life to be pitied, and yet Justin’s trusted friends often reproached him for how he brought up his child, what he had deprived her of, and how lonely it was to tag along constantly with a bachelor father eternally on the prowl. It was remarkable that in some ways even at nineteen she was still so youthful, still so innocent, with those enormous emerald eyes; yet there was the wisdom of the ages lurking there too. Not because of what she had done, but rather because of what she had seen. At nineteen she was still in some ways a baby, and in other ways she had seen an opulence, a decadence, an existence that few men or women twice her age had ever seen. Her mother had died of leukemia shortly after Bettina’s fourth birthday and was nothing more than a face in a portrait on the dining room wall, a laughing smile with huge blue eyes and blond hair. There was something of Tatianna Daniels in her daughter, but not much. Bettina looked like neither Tatianna nor Justin. She looked mainly like herself. Her father’s striking black hair and green eyes were not wholly unlike his. However her hair was rich auburn, the color of very old, very fine cognac. His tall angular frame was in sharp contrast to Bettina’s, which was narrow, minute, almost elfin in its delicate proportions. It served to give her an aura of fragility as she brushed the auburn hair into a halo of soft curls, as she did now, looking at her watch once again. Bettina made a rapid calculation. Twenty minutes. She would be on time. She sank rapidly into the steaming water in the tub and sat there for a moment, trying to unwind as she watched the snow falling outside. It was November, and this was the first snow. It was also their first party of the “season,” and for that reason it had to be a success. And it would be. She would see to that too. She mentally checked over the guest list again, wondering if there were some who would fail to arrive because of the snow. But she though it unlikely. Her father’s parties were too celebrated, the invitations awaited too breathlessly for anyone to want to miss the occasion or risk not being invited again. Parties were an essential part of the life of Justin Daniels. when he was between books, he gave them at least once a week. And they were noteworthy for the people who came ant the costumes they wore, the incidents that happened, the deals that were made. But above all they were special, and an evening at the Danielses’ was like a visit to a faraway, once-dreamed-of land. The parties were all spectacular. The luxurious surroundings sparkled in seventeenth-century splendor, as butlers hovered and musicians played. Bettina, as hostess, floating magically between groups, always seemed to be everywhere that she was wanted or needed. She was a truly haunting creature; elusive, beautiful, and very, very rare. The only one who did not fully realize how remarkable she was, was her father, who thought every young woman was naturally as gracious as Bettina. His casual acceptance of her was something that had long since irritated his closest friend. Ivo Stewart adored Justin Daniels, but it had irked him for years that Justin never saw what was happening to Bettina, never understood how much his attention and praise meant to her. Justin would only laugh when Ivo made comments, which he did frequently, shaking his head and waving a well-manicured hand at his friend. “And better!” Justin pointed out as he laughed. “I’m serious.” Ivo looked stern. “I know you are. Too much so. You worry too much about the girl.” Ivo hadn’t dared to tell Justin that if he didn’t worry about her, he wasn’t sure if Justin would himself. Justin had an easy, cavalier way about him, in sharp contrast to Ivo’s more serious view of the world. But that was also the nature of Ivo’s business, as publisher of one of the world’s largest newspapers, the New York Mail. He was also older than Justin, and not a young man. He had lost one wife, divorced another, and purposely never had children. He felt it was unfair to bring children into such a difficult world. And at sixty-two he did not regret the decision. . . except when he saw Bettina. Then something seemed always to melt his heart. Sometimes seeing Bettina, he wondered if remaining childless had been a mistake. But it didn’t matter now. I was too late to think about children, and he was happy. In his own way he was as free as Justin Daniels. 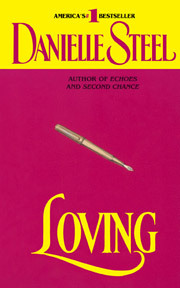 Excerpted from Loving by Danielle Steel Copyright © 1981 by Danielle Steel. Excerpted by permission of Dell, a division of Random House, Inc. All rights reserved. No part of this excerpt may be reproduced or reprinted without permission in writing from the publisher.